Just when we thought an old dog was all out of tricks, along come these bad boys. The Sunset-Industrial Complex has already filled our bellies and our pages on three separate occasions, and we were suffering from nacho-induced fatigue. Fortunately, Big City came along and renewed our passion for the sport with arguably their best contribution to the nacho canon so far, the Mediterranean Nacho: pita chips covered with spinach and artichoke dip, jack and feta cheese, chopped balsamic tomatoes, kalamata olives, roasted peppers, and hummus on the side. Quality of Ingredients: (10) On the whole, everything was delicious. With so many unique flavors floating around on the plate, each bite was an adventure. The tomatoes, peppers and olives provided a nice texture contrast to the creaminess of the cheese and spinach dip. The hummus was particularly delicious, some of the best we have ever tasted. Distribution of Toppings: (9) Sunset (and by extension Big City) knows how to layer. There was a definite secondary cheese layer underneath which filled us with glee. Even without such exceptional layering, these nachos could have survived: pita chips on their own are far more entertaining to the palate than tortilla chips, and the hummus for dipping was sublime. The cheese ratio was well thought out– it was about 2/3 jack, the rest feta, providing just the right amount of flavor and texture. 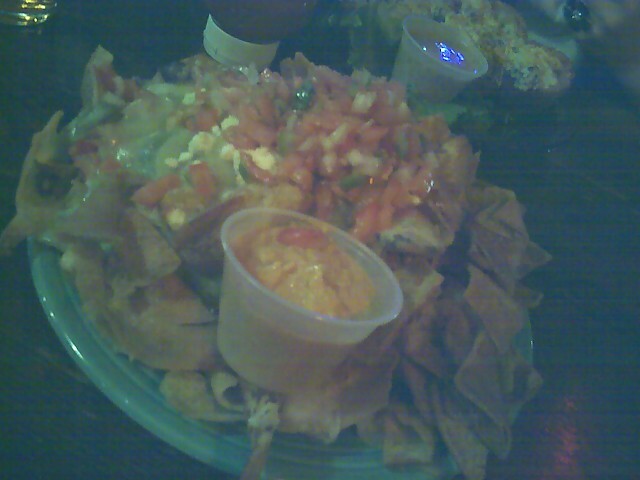 Price: (8) Nine bucks for a delicious, memorable and manageable plate of nachos. Overall: 34. The best specialty nacho we have ever seen would undoubtedly hold its own in the big leagues as well.